Welcome to the fifth issue of Strop Talk! We are dedicated to bringing you new, fun, and informative content in each of our Strop Talk e-newsletters. Combined with our magazine, website, and online forum, Strop Talk is another way to help keep the creativity flowing and the carving knives sharp all year long. Brighten up a dreary day with this whimsical winter character carving pattern. With few artistic exceptions, every face or figure carving has a nose. 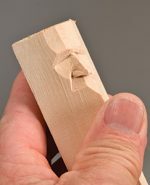 While each nose is unique, once you learn the basics on how to carve one, you can create a custom one for every carving. Free pattern included. This project is sure to brighten your evenings. Free pattern included. Read about how Jeffro Uitto both creates beautifully sculpted furniture from recycled wood and forges his own handmade tools. A Funny Thing Happened on the Way to the Pinewood Derby. Our “quick and easy” book update turned into a major project, complete with destruction, do-overs, plenty of laughs, and a heap of physics. Click here for a peek behind the scenes as we try to make it to the finish line with our guide to Pinewood Derby cars. A Florida carving club made replica lighthouses and then took a tour of the real thing. Click here to read their story. Looking for a product review or tool mention? Check our website! We’re building an archive of all of our reviews. Click here to visit our online Product Reviews directory. Have a favorite that you don’t see online—or a tool you’d like us to review? E-mail the info to: editors@woodcarvingillustrated.com. Thinking of submitting a project for our Reader Gallery? 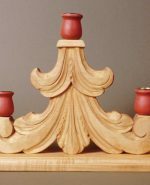 Want to make your carving project stand out in a photograph? Look no further! Click on the links below to views tips on how to better light, compose, focus, and size your photographs. CLICK HERE for tips about photo lighting. CLICK HERE for tips about photo composition. CLICK HERE for tips about photo focus. CLICK HERE for tips about photo resolution. Caricature Soldiers by Floyd Rhadigan is available now! The book includes patterns for a dozen military men and women. Click here for more information.